The finance profession can expand its talent pool and increase the average quality of professionals by encouraging more women to consider careers in finance (according to Stumpp 2013, women are less than 20% of investment professionals in the USA). Part of the gender gap issue comes from a lower percentage of women majoring in finance during the college years (only 30% compared to 48% in all business majors). This could be a result of different reasons such as lack of required training, avoidance of competitive environments, discrimination etc. Do (female) role models influence the career choices of young men and women? If #1 is “Yes,” does having a STEM parent close the math gender gap? YES- having a STEM parent or sibling raises the probability that a daughter becomes a CFA member more than that of a son. 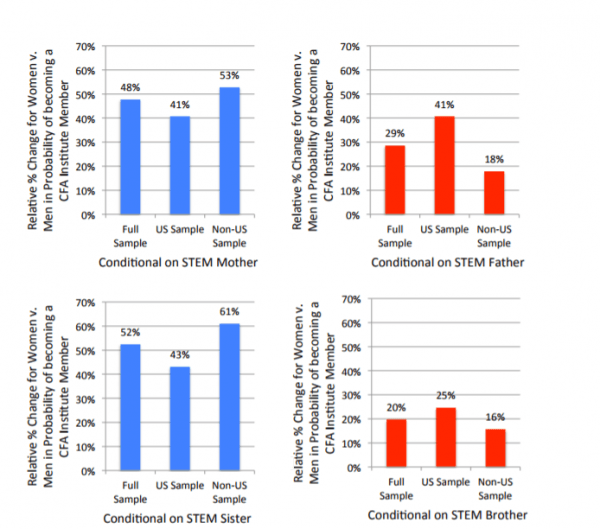 In particular, having a STEM father, a daughter is 29% more likely to become a CFA compared to a son, while having a STEM mother raises this probability to almost 48%. NO- at least in relation to the PISA data, the authors do not find strong evidence that having a STEM parent closes the math gender gap. The post "STEM Parents And Women In Finance" appeared first on Alpha Architect.